There are two key thoughts that bind the daily lessons together to understand the “equipping”. The first is that one must have personal assurance of salvation to lead others to a personal and saving relationship with Jesus. The second is that one must truly understand the gospel message. It is true that a (restored) relationship with Jesus is our salvation (Rom. 4-5). Our “equipping”, or “witness” is the power of the Holy Spirit indwelling us (Acts 1:8). It is important to note that equipping is a result of our salvation. Also, we are justified by faith alone, not works (Rom. 5:1; Eph 2:8-9). I emphasis these two points because SDAs hold some confusion in regards to the “what” and “how” of salvation. We will look briefly at the two key thoughts and the SDA teachings behind each one. 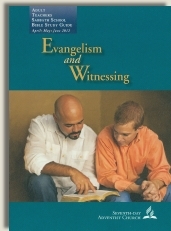 SDAs do not fully grasp “the everlasting gospel”. God wants us to KNOW that we are saved; we have passed from death to life at our moment of belief!!!!!! These statements reveal that Adventism does indeed teach salvation by faith plus works. Obedience, commandment-keeping, perfection or sinlessness are all necessary to obtain and maintain salvation. As a result of man’s works (continued sin or disobedience), one cannot be confident in their salvation. Seventh-day Adventism holds to a false gospel. Man is not saved by grace alone through faith alone in Christ alone (as evidenced above). Instead, man is saved by faith in Jesus plus good works (of obedience). The Adventist gospel, then, is a false gospel (Gal. 1:6-10). Their gospel is not good news at all. Man is at least partially dependent on his/her own works, and their salvation is not secure. Adventism holds Ellen G. White to a higher authority than God’s word. The Adventist “pillars” of “distinct doctrine” (ie: Sabbath as the seal of God; the Investigative Judgment/Pre-advent Judgment; etc) are to stand firm even when shown to be an incorrect interpretation and even refuted by the Word of God. Ultimately, even God’s Word cannot discredit the “Spirit of Prophecy” that inspired Ellen G. White. To be clear, no one has power or authority to change God's Word. In fact we are warned not to add to or take from it (Isaiah 8:20; 1 Cor. 4:6; 2 Corinthians 4:1-2; Rev. 22:18). Most importantly believers are called to protect His Word (Jeremiah 23:36; 2 Timothy 1:13-14; Titus 1:9). I would contend that the Seventh-day Adventist Church has changed some substantial parts of the Bible; and have in fact published a translation of their own, the “Clear Word”; which includes the revelations and inspiration of their prophetess, Ellen G. White. These teachings are written into Scripture and change the identity of God and the works He has accomplished on our behalf. For example, the Adventist teaching of the Investigative Judgment (or Pre-Advent Judgment) significantly weakens Christ's atonement and undermines what occurred at the cross. SDAs believe and teach the scapegoat is Satan and that he, instead of Christ, removes the sins of God’s people. Their “Great Controversy” world-view teaches that Christ did not gain victory over sin and death at the cross and that there is still a battle to be fought and won between God and Satan. The cross yielded only partial victory. God must still vindicate His righteousness to man and most importantly to Satan. 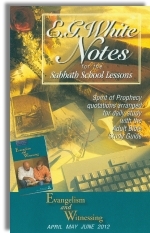 Adventists also believe that Sabbath observance (instead of Sunday) is the seal of God. This teaching is blasphemous and a direct contradiction of God's Word and the work of the Holy Spirit (Eph. 1:13-14). I could go on, but those are a few interpretations Ellen G. White, under spiritual “inspiration” falsely applies to God’s Word. But God wants us to KNOW that we are saved; we have passed from death to life at our moment of belief (1 John 5:13; John 5:24). The Seventh-day Adventist Church does not own the “everlasting gospel” of Jesus Christ. How can they then evangelize it to a lost world? Adventism holds to a false gospel (Gal. 1:6-10). Man is not saved by grace alone through faith alone in Christ alone (as evidenced above). Instead, man is saved by faith in Jesus plus good works (of obedience and Sabbath-keeping). Their gospel is not good news at all. Man is at least partially dependent on his/her own works unto salvation, and their salvation is not secure.